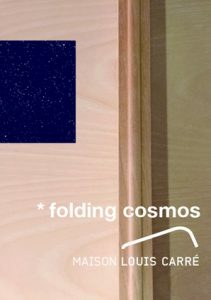 * folding cosmos is based on the story of the ‘One-Mat-Room’, a small meditation and study room created by the Japanese explorer Takeshiro Matsuura at the end of the 19th century. Project designer and director Miwako Kurashima creates a contemporary version of this minimal space within the Maison Louis Carré, combined with a Japanese tea set, inviting artists to create site specific or adapted works for this particular context. Alvar Aalto was much inspired by Japanese culture at the start of his career and this can be observed throughout the Maison Louis Carré. The small cosmos room relates naturally to the spaces of the villa, with the strong bond between design details and architecture, inside space and nature, minimal entity and the universe. The collaborating artists are: Carine Guimbard, Ai Kitahara, Kineta Kunimatsu, Mireya Samper and Ayumi Tanaka. As a metaphor for the ‘folding’ and ‘traveling’ cosmos, the AKARI PL2 lighting by Isamu Noguchi is displayed close to the * folding cosmos set made for the Maison Louis Carré.